Parking on Woods Point Road was in gridlock on the Queen''s Birthday weekend. 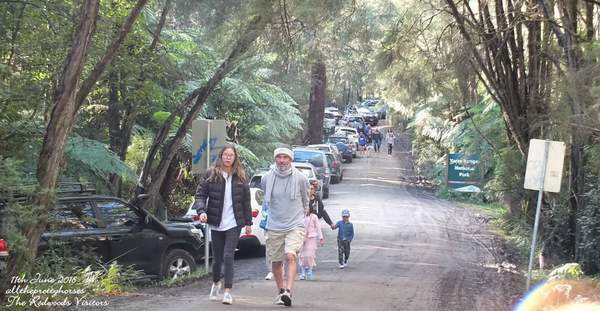 The unexpected consequences of a tree-planting hydrology project that has emerged as Warburton’s most popular tourist attraction is making residents lives intolerable, and putting visitors at risk. 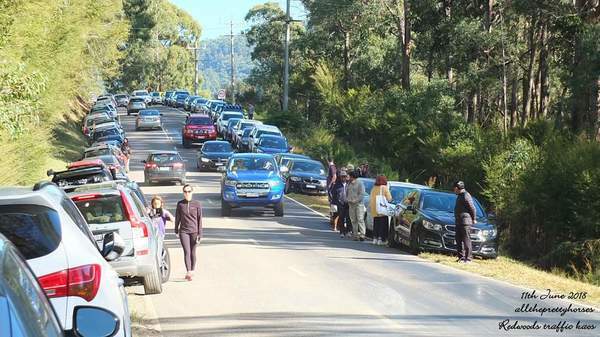 The Queen’s Birthday long-weekend saw thousands of people visiting Parks Victoria’s Redwood Forest in East Warburton creating parking chaos on Cement Creek Road and the main Woods Point Road nearby. Cr Jim Child raised an urgent motion at Yarra Ranges Council Meeting on 12 June calling for the Council to work with Parks Victoria, Victoria police, VicRoads and DELWP to resolve “untenable road safety issues” resulting from the tourist explosion. He also called on the Council to look into the cost and options for sealing a small section of Cement Creek Road which leads into the forest. “There are four residents who live on Cement Creek Road and their lives at the moment are intolerable,’ he said. “They are at their wits end with pedestrians and cars passing their homes all the time, traffic in gridlock outside their homes and people using their properties as toilets,” he said. A series of photos showed people walking on the main Woods Point Road with many parking illegally opposite double, continuous and dotted lines. In a tourism market where millions is spent on promoting local attractions, the Redwood Forest is an anomaly having been the best kept secret of the locals for decades, it has become possibly the biggest tourist attraction in the Upper Yarra solely through promotion on social media. The forest was planted with nearly 1500 Californian Redwood trees in the 1930s by the Board of Works, the tallest of which is now 55 metres high. ‘Magical’ is the most used descriptive of the forest and Cr Child emphasised that it is a “wonderful place to visit”. He said however it needs to be managed. “This is a classic example of where all of a sudden we have this to deal with and we have to work out how we can do that and keep it open, because it is a wonderful asset,” he said. He said while his second request, for sealing of Cement Creek Road might seem a ‘tall order’, there were four residents on a 300 metre section of road for whom the popularity of the Redwood Forest was causing grief. 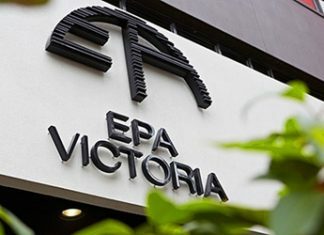 Parks Victoria District Manager Georgia Kerr said they were working with Yarra Ranges Council to improve visitor management and safety along Cement Creek Road and within the Redwood Forest. “Parks Victoria has increased ranger patrols and is planning a number of improvements in response to increasing visitor numbers. “The improvements will include development of additional parking, formalising the existing informal walking track and installing new directional, regulation, information and entrance signage,’ she said. One of the issues that is causing problems for visitors and residents is that there are no toilet facilities. Cr Child said staff at the Warburton Visitor Information Centre advised people of the traffic, parking and toilet challenges and said part of the ‘quick fixes’ may have to include letting people know they have to look after their toilet habits before they leave Warburton. “Redwoods is not going away,” he said. “If we can look at managing the site and getting a good outcome for 80 per cent of the time, probably the other 20 per cent on high visitation days will be tough to manage.